110 Creations: The S.O.S. Challenge Reveal! Today I'm excited to be sharing the results of the S.O.S. 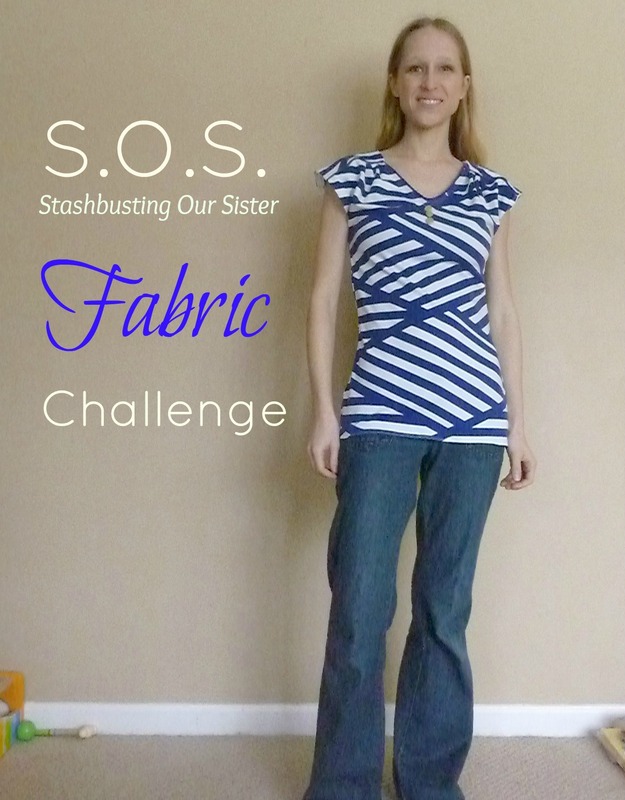 (Stashbusting Our Sister) fabric challenge! Be sure to hop over to Four Square Walls and Made by Trisha to see what Andrea and Trisha have done with their fabric! I'm going to cut right to the chase and reveal my project! I decided not to buy a new pattern just for this project, so I used Simplicity 2594 (you may recall that I posted a version last week). This time around, I wanted to make the view with the sleeves. It's the same cut of the bodice, but with a sleeve and tab added. I'll be very blunt: this idea did NOT work out! So let's look at more photos of the finished item, just to make myself feel better. I'm smiling to keep back the tears. It doesn't look as bad in this photo as it did in real life, but trust me, it was baaaaad. But let's forget about that and look at more pretty results instead! To save the top from the sleeve disaster, I turned the sleeves to the inside and used them as a facing instead, then cut off the excess. Since I was now tab-less, I used the buttons on the center front. Part of the reason why the fabric was so thick was the addition of blue piping along the shoulder seams and neckline. It's a subtle detail, but I like how it turned out. Even if it did make me curse the entire time (I've never used piping before...and it may be a while before I do again!). The double topstitching is functional as well as fashionable. All the layers were hard to contain without the extra stitches. At a later time, I may get some thicker topstitching thread and go back over it all to clean things up a bit. The ponte knit was a total DREAM to sew, and I only used a straight stitch and a regular zig-zag foot. No puckering. It has the perfect amount of stretch, and is thick enough to keep warm in this variable spring weather. I was able to make the top pretty snug and it's still crazy comfortable to wear. I'll be buying more ponte knits for sure. I used white ponte knit from Jo-Ann's for my back yoke facing. I wouldn't have had enough nautical fabric for that facing without piecing, plus I was afraid of a double-layer of mismatched stripes. I managed to match the stripes up slightly on the back and back yoke. Doesn't look too bad! Another thing I did differently with this version of the pattern was to trim down the front facing. On my flowered version, it's constantly flipping up and annoying the crud out of me. Notice I'm using the white ponte here for the front facing as well. I decided to take a chance and just cut the extra fabric off. Inside view, minus annoying extra facing fabric. I'm sure I've broken some hard and fast sewing rule by doing this...but it's SO much better not to have that fabric flapping around in there. The pattern is designed for wovens, but I find it hard to believe that a facing wouldn't be annoying in any circumstance. If someone would like to explain what I'm missing here, I'm all ears! I'm so glad I participated in this challenge. I may never have gotten around to using this fabric otherwise, and once I started, I might have given up out of frustration! Now I have a top I really love and can't wait to wear, and a new-found love for ponte knits. Anyone else worked with ponte before? Did you notice that Girl Charlee is accepting pre-orders for a nautical print jersey in three colors (back by popular demand)? These stripes are certainly not for the faint of heart! I love it! I have this pattern, too, and actually considered making it with this fabric. That would have been funny. Glad you jumped on the challenge with Trisha and me, and glad you had such success! And you're right - this fabric was awesome to sew. Ponte knit is one of my favorite fabrics. That's a fancy top to squeeze out of 34"... I'm impressed! Glad you persevered, and ended up with a great top. Thanks! I even have a bit of fabric left over, I'm thinking my daughter needs something to match! I think it looks fabulous on ! I love the fabric choice also. I have just recently began watching Project Runway, and your review reminds of what they go through, changing, and "making it work". two thumbs up from me ! I definitely wanted to scrap it and start over, but I decided to push through like they do on PR haha. I just pictured Heidi and Nina waiting for me on the runway! Hi Reyna, thanks for following and great to have you! This fabric was certainly great and fun to work with, I may have to pick up some more nautical stripes soon! cool top and great details, especially the piping. love this print! Thanks Dixie! It's great how small details like piping can make something special.